Grammarian PRO X 1.7 is a Universal Macintosh application and input method component. Input method components must be built as Universal for use on an Intel-based Macintosh. 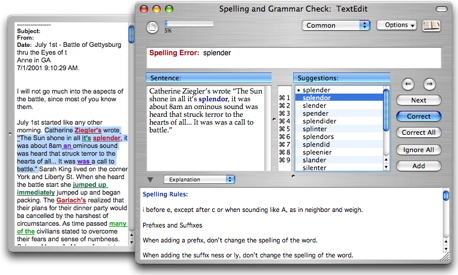 Grammarian PRO X now brings Grammar-lite to spell checking! When racing to send an email, you don't always want to do a complete grammar check. 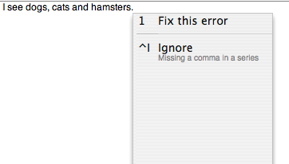 With Grammar-lite spell checking, you can choose to have some basic grammar corrections included with your spell check for simple and fast, one-click correction! These settings provide grammar functionality with spell checking. All settings are user-configurable. The Error View drawer shows hyperlink errors in different colors. Spelling errors are red, grammar errors are green, and punctuation errors are purple. 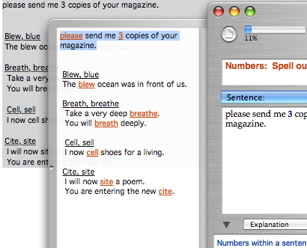 Now, Grammar-Lite spelling errors are marked with orange. Clicking on any of these error hyperlinks selects the error for correction. Grammarian's check selection windows now add "Correct All" functionality. "Correct All" replaces all instances of the original in the document with the selected suggestion. • Grammar and spelling number error catching: "Spell out numbers at beginning of sentence" and "Spell out numbers within sentence". Numbers at the beginning of sentence: Spell out all numbers at the beginning, even when other numbers are expressed in figures. Two carloads of new corn were received today. Twenty members were present at last month's meeting. Numbers within a sentence: Spell out all numbers from one through ten, except in a series of related numbers. The two boys consumed 4 hamburgers, 2 cans of soda, and 6 cookies. The football team won 8 games and lost 2 last year. • Punctuation series commas error catching. Rule: When three or more items are listed in a series and the last item is preceded by a coordinate conjunction, place a comma before the conjunction as well as between the other items. Example: Study the rules for the use of the comma, the semicolon, and the comma. Note: if a nonessential element follows the conjunction (and, or, or nor) in a series, omit the comma before the conjunction to avoid excessive punctuation. • Control-number key shortcuts for the interactive popup menu. This preference enables either numbers or control-numbers for shortcut replacements. • New preference window settings checkbox for Check Selection suggestions list font sizes (small or large) with real-time view activation. 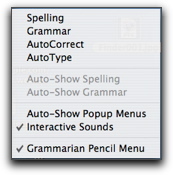 • New Show/Hide Grammarian Pencil Menu preference from Input Menu Interactive submenu. The setting is per application. • New: Readability Save As from File menu when Readability Statistics window is open. The statistics is saved to a file for later viewing or compiling information. • New: Interactive, AutoCorrect, and AutoType faster direct replacements without backspacing for all applications that support this. Grammarian automatically checks for compatibility or this through TSM DocumentID. 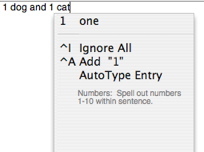 • New: AutoType/AutoCorrect preference setting: "Always replace with backspacing" checkbox. This safety setting is for instances for which future applications support TSMDocumentID but behave erratically. 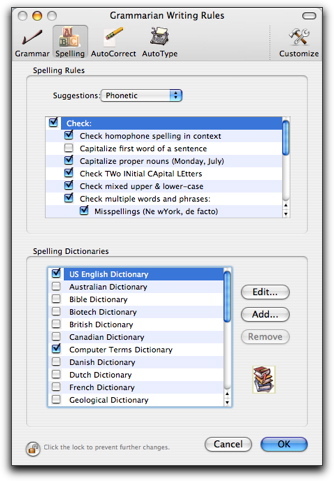 • New: Spell Checking "Check pronouns" now includes personal names. • New: Mouse scroll-wheel support for Writing Rules preference window. • Fixed: Grammarian "Show Suggestions" always disabled menu item in MacOSX 10.4 Tiger. • Fixed: Grammarian would switch/toggle the Dock Menu on/off if the Application Support/Grammarian folder was discarded (New: Grammarian Launch/Grammarian Relaunch). • Fixed: Unicode conversion problem with Grammarian Spelling Service. German umlaud characters were being treated as word breaks. • Fixed: Apple introduced a Databrowser custom draw bug that erases items in the popup menu when using the mouse only. • Fixed: Buffer length issue with check document window. Replacements were cut short if replacement exceeded 256 characters. • Fixed: RTF clipboard formatting parse issues for Mellel 2.0. • Fixed: minor RTF control word delimiter issue. • Fixed: Some missing (new) RTF control words. • Fixed: Tiger now disables TSM sessions when a menu pops up. This interfered with Grammarian's Pencil menu item "Show Suggestions". Panther does not do this. • Fixed: AutoCorrect Capitalize pronoun bug. • Fixed: AutoCorrect Correct two Initial capital letters bug. • Fixed: When Interactive popup menu or window was visible and the Escape key was hit, Grammarian reset all buffer counts as a mouse click or up/down arrow key. This no longer happens. • Fixed: Spelling diacritic marks for error suggestions for foreign languages. • Fixed: AutoCorrect Capitalize first word of sentence when a new document is opened. • Fixed: Work-around for bugs in Apple’s Mail 2.0 application on Tiger relating to the way it handles spaces and carriage returns sent to it by an input method. Mail handles spaces and carriage returns typed on a keyboard differently from spaces given to it from an input method. Replacements and AutoType, containing many spaces or carriage returns, will be slightly slower in Mail 2.0 than other applications. • Major code optimization speedup including application launching. • Fixed: Tiger permissions issue with the updating of the Grammarian component. • New: Many new interface changes. • Updated: English Spelling Dictionary v1.14. • Many more minor fixes.